Skype Spam • Want to know more? Audio Spam, Specifically Skype Spam an automated phone call and recorded message. In this case it suggests that there is a problem with the computer security and that to rectify it go to a certain web address. I imagine if the proposed website exists you’ll find something other than assistance. I’ve read in one article* listed below that ‘Skype user message boards devoted to spam go back well into 2006; the spammers back then ranged from online casinos to Chinese jibberish’. I only started to receive the security warning from the 14th of December 2011. So it could be worse. That said for some time I have received automated phone calls from India, Voip numbers featureing a selection of 1’s and 0’s. So spam over the wires is not a new thing at all. Perhaps a little bit of a shock it arriving via computer now. Does it bode well for VOIP phone calls though? Tune into SouthEast Radio this Saturday the 28th April 2012 > 10.30am – 11.30am South East Radio’s Business Matters with Karl Fitzpatrick to hear a discussion on why more and more business’ are turning to VOIP. It’s possible by answering the call in the first place I have informed the sender of the spam that that the skype address is a live address. So what can I Do? Skype tells Windows users to report it and follow their Skype security advice. 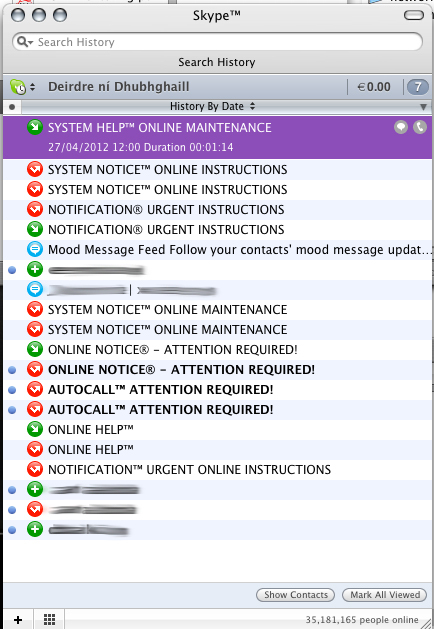 An artcile by Jim Higdon | January 28, 2008 on Voip-news.com * What’s the Deal with Skype Spam?